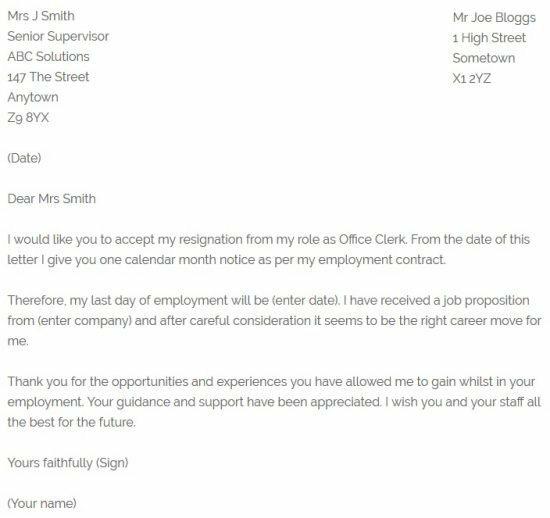 If you want to quit from your Office Clerk job then use these resignation letter examples for free. You should amend the examples as suitable and send it to your employer via email or post. I would like you to accept my resignation from my role as Office Clerk. From the date of this letter I give you one calendar month notice as per my employment contract. Therefore, my last day of employment will be (enter date). I have received a job proposition from (enter company) and after careful consideration it seems to be the right career move for me. Thank you for the opportunities and experiences you have allowed me to gain whilst in your employment. Your guidance and support have been appreciated. I wish you and your staff all the best for the future.